This one (well, three) I picked not just for the many and delightful tea references, but for the authors representation of his characters. The wit he brings to them combined with their depth of personality, not to mention the consideration given to their cultural backgrounds respectively, make for a compelling pair of protagonists in a convincing -though not historically accurate by the his own admission- early 19th century world. Though the story is mostly narrated by her companion, Selim, it's Delilah who drives these tales; bringing vitality, defying expectations, so that there seems to be no limit to her daring. While we often see her brooding or raging, this doesn't undermine her boldness. She is written and beautifully illustrated as a determined, independent and shameless adventurer with a knack for getting into trouble, and always managing to get back out. Her independence is what makes her companionship with Mr. Selim so perfect. She doesn't really need him, as much as she just wants someone she can share her travels with. While she appreciates him, and he is inspired by her, the relationship is allowed to remain one of respectful admiration. Selim is something of a foil to Miss Dirk. A gentle, thoughtful, and careful man with an appreciation for good tea. Though he may be reluctant, and apologetic, his travels with Miss Dirk are marked by a sense of wonder, and an eagerness to be of use - though his skill set and approach is quite opposite our heroines. I want to try that tea!!! I'm in love with the pair of them. And besides that, I'm in love with the use of tea in these stories. Selim, the Turkish tea connoisseur keeps the kettle on and the teacups ever-full throughout their travels. From our first encounter with him, we learn through a tea tasting his ability to see to the heart of things, to look beyond the surface. This wisdom is what allows him to open his mind to Miss Dirks unorthodox ways, despite his superiors insisting "a woman could never..."
Tea is also used to deescalate situations, as a calm reminder that while things may get intense, it's good to slow down and appreciate what's in front of you, be it a steaming cuppa, or a concerned friend. 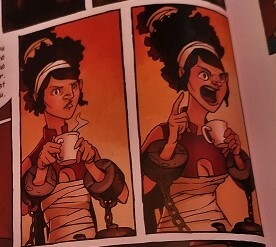 And sometimes, after a long day of plundering, a good cup of tea is just the thing, especially if you're a total tea drinking badass like Delilah Dirk. So yeah, go read them! 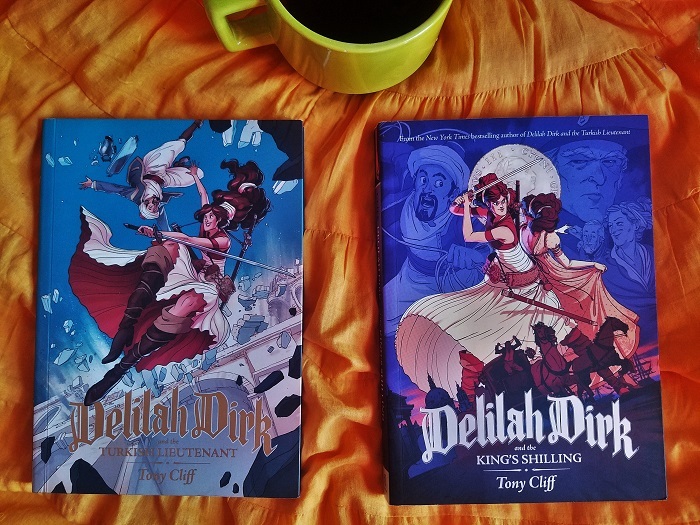 The first two Delilah Dirk and the Turkish Lieutenant (read the first 4 chapters free!) and Delilah Dirk and the Kings Shilling are both beautiful full color graphic novels. The latest addition, Delilah Dirk and the Seeds of Good Fortune is a short black and white mini-adventure. Sadly no tea in this one, but it's a touching tale. You can download it and pay what you like here. Each one is a strong stand-alone story, so you need not read them in the established order (I borrowed the second book from a friend and read that first), but do give them a look, I promise you won't be regret it!